In an interview with ABC’s “Good Morning America,” Myeshia Johnson, widow of Sergeant La David T. Johnson, also said she has been told little about how her husband was killed and has not been allowed to see his body. Johnson’s comments, her first to the media about the condolence call from Trump, were likely to fuel a controversy that has swirled for days around the president’s handling of the call to the widow. Johnson said that when Trump called, she and other family members were in a limousine riding to an airport where her husband’s body was shipped. Wilson was also in the car. The widow also said that the military has told her little about what happened in Niger, and that she is upset that she has not been allowed to see her husband’s body. 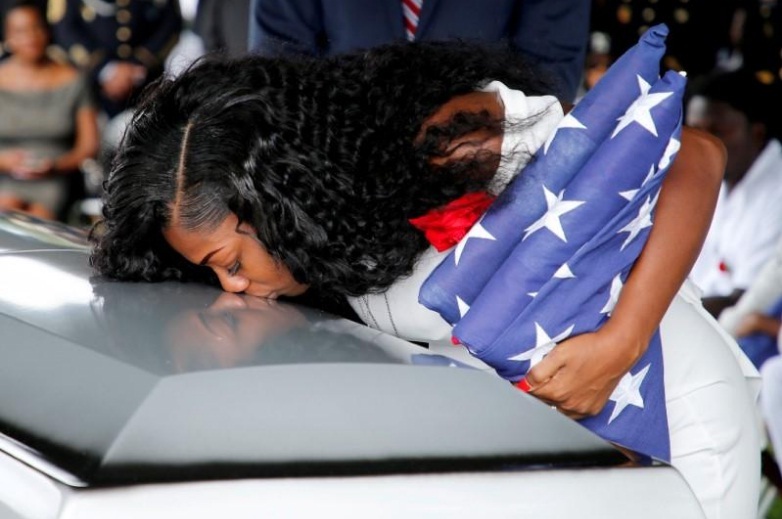 The widow of a U.S. Army sergeant killed in Niger this month said on Monday that President Donald Trump “made me cry even worse” in a condolence telephone call when he said that her husband “knew what he signed up for.” In an interview with ABC’s “Good Morning America,” Myeshia Johnson, widow of Sergeant La David T. Johnson, also said she has been told little about how her husband was killed and has not been allowed to see his body.